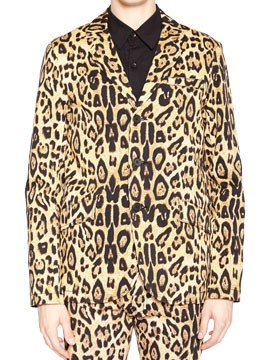 Tripp NYC Top Cat mens long sleeve button up blazer in tan brown and black leopard pattern all over front and back. This blazer features a modern look with three button closure, one chest pocket and two front pockets. This jacket provides extra stretch fabric for comfortable fit and movement. Matching Top Cat slim straight trouser pants sold seperately. Tripp NYC is a exclusively handcrafted designer brand. A favorite among musicians, artists and music enthusiasts. 97% Cotton 3% Spandex. Color: tan leopard.